Join the fun and doodle with friends at Twisted Fish Gallery for this new and first-of-its-kind Doodle Art Day. For ages 9- 90. There is no right or wrong way to doodle! 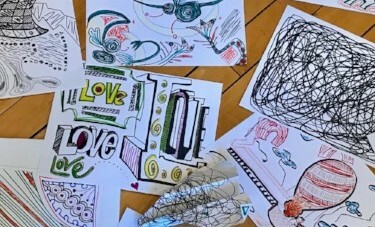 Doodling is a visual expression of what is in your head or heart. The creative act and overall artistic expression are what’s important. The gallery’s doodling sessions are relaxed and casual. Join us to enjoy socializing, refreshments and good music. Share and discuss your doodling with others if you chose. Plan to come join the group, and experience a new opportunity for shared expression through doodling!